Halloween is about fun, spookiness, and lots of candy! I love to upcycle things on my blog, Thrift Diving. 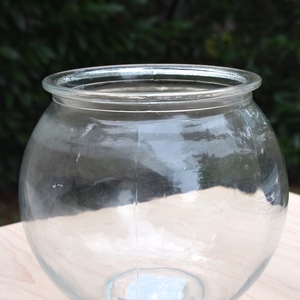 So I decided to turn an old fish bowl from the thrift store into a spooky DIY candy dispenser made with a wooden base! 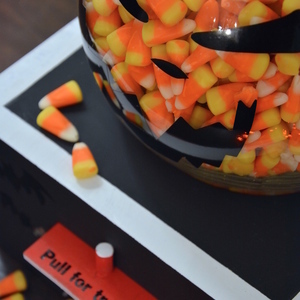 This candy dispenser can be used with almost any small candies, such a gumballs, jelly beans, etc. I love upcycling things from the thrift store! 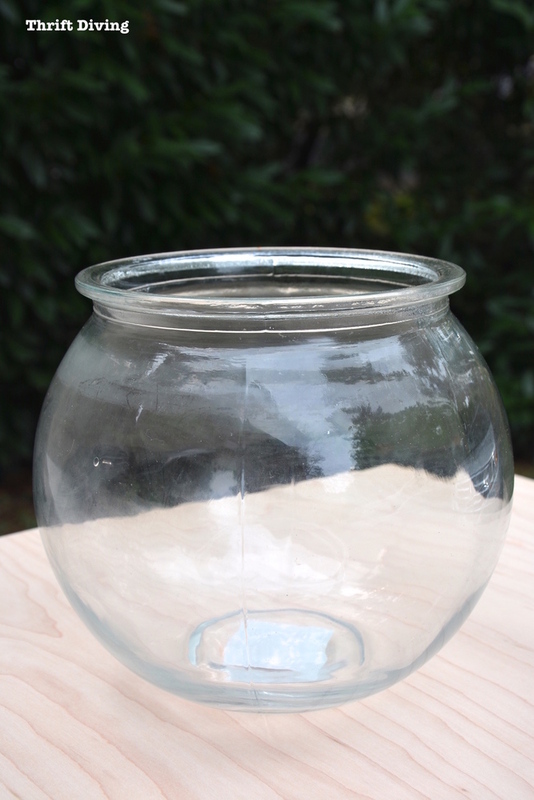 When I saw this thrifted fish bowl I knew it was perfect for a DIY candy dispenser for Halloween since the shape reminded me of a pumpkin! 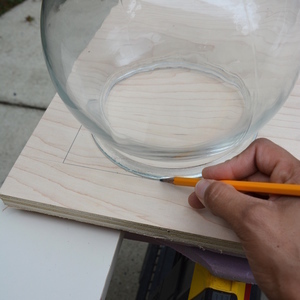 I created a square starting at one corner of a large piece of birch plywood, and with 1.5" from each side, I traced the shape of the fish bowl. 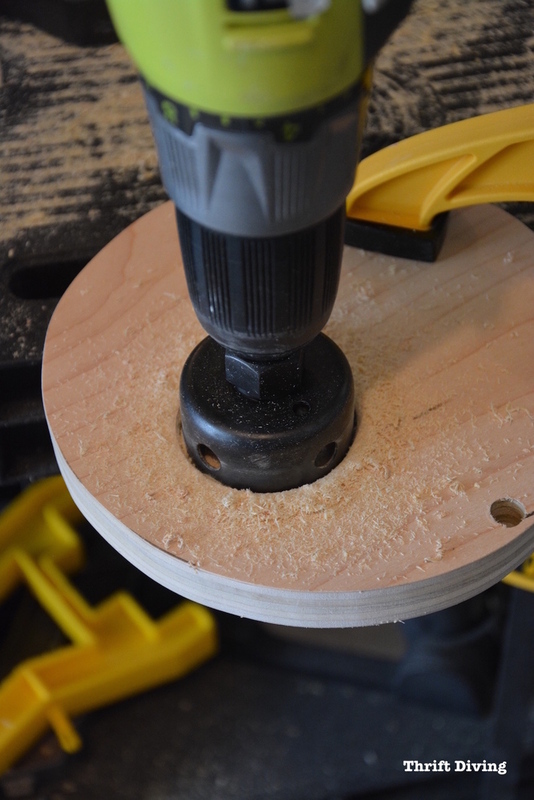 Using my power drill, I drilled a pilot hole, then used my jigsaw to cut out the circle. 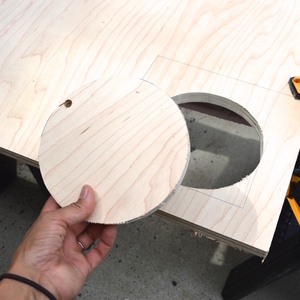 Once the circle is cut out, keep the circle nearby! You'll need it! 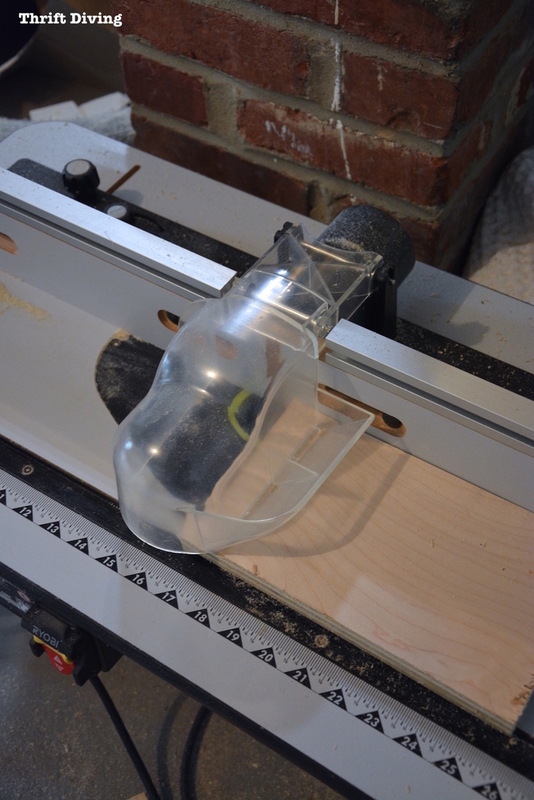 This piece will be glued onto the fish bowl. 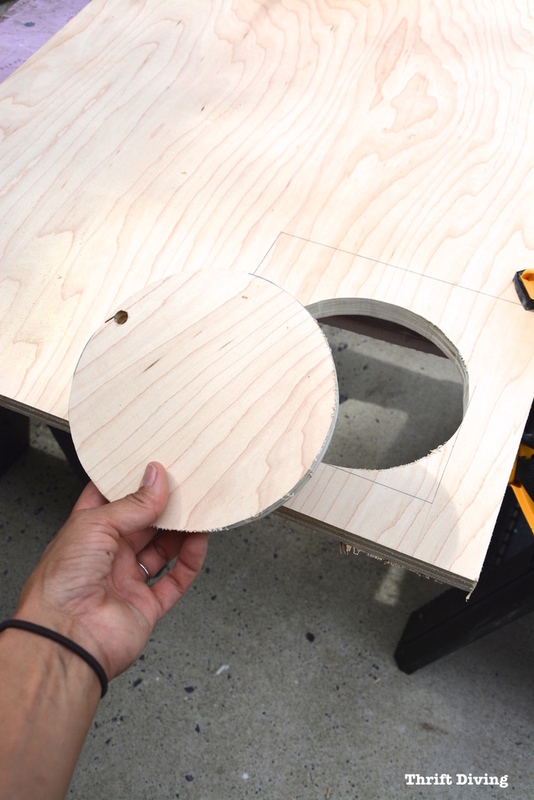 Using a hole saw, drill a hole in the circle you just cut out. 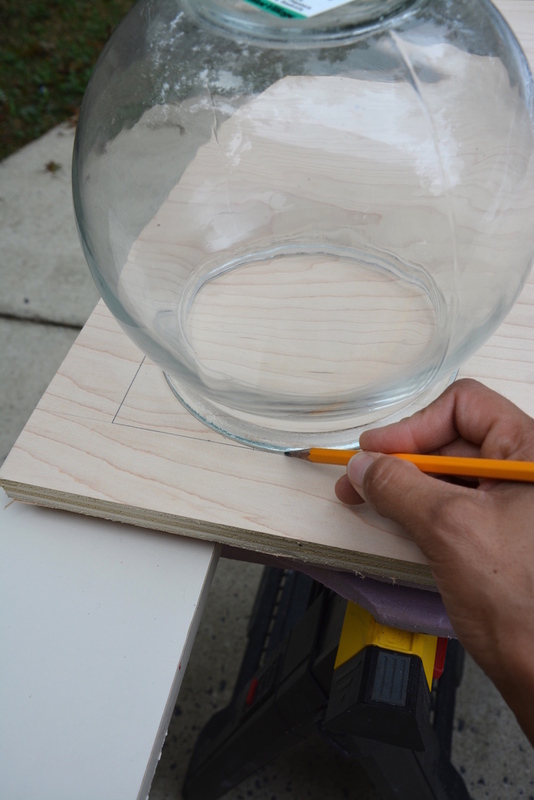 Once the hole is cut, use Gorilla Glue epoxy to secure the circle onto the bottom of the fish bowl. 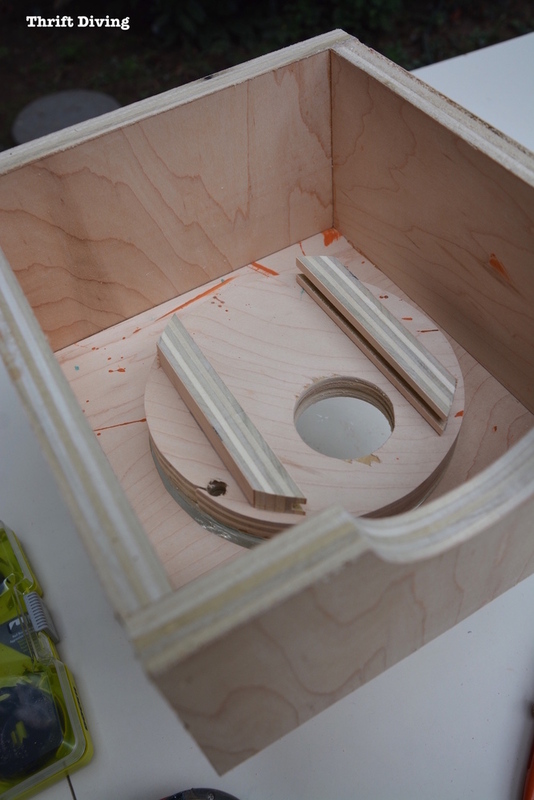 Using my router, I created 1/4" routed pieces which will be attached to the wooden circle on the bottom of the fish bowl. 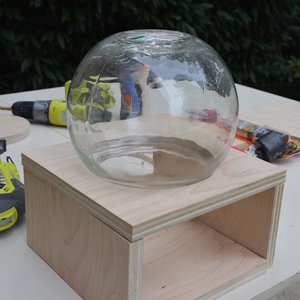 When the routed pieces are trimmed and added to the bottom of the fish bowl with glue and nails, it creates a place for the pull to slide in and out to allow for candy to fall out. 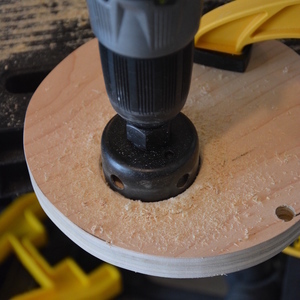 Cut wood to create the rest of the base. 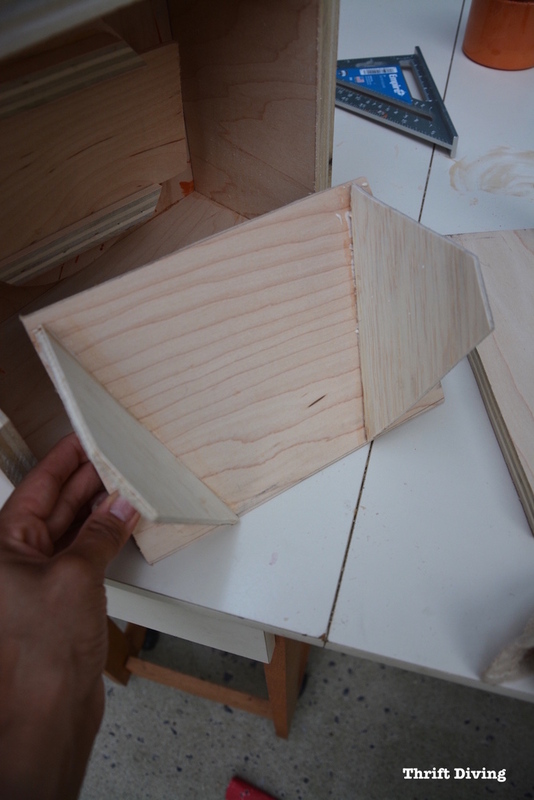 You'll need 4 sides upon which to sit the top that you'd already cut. There won't be a bottom piece. 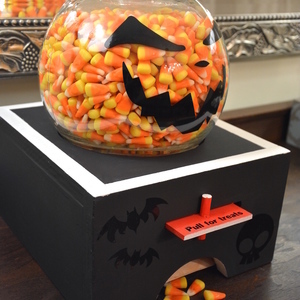 Leaving the bottom open will allow you to add candy. 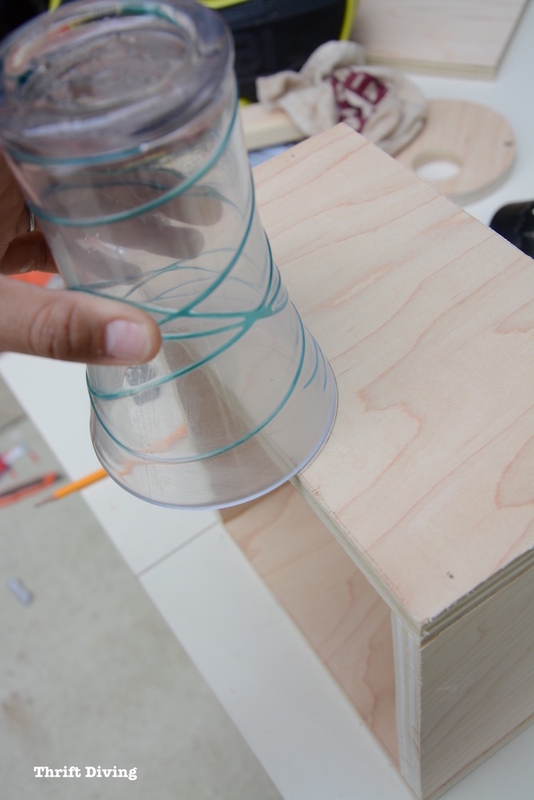 Use a cup or something else with a rounded edge to create the opening in the front of the candy dispenser, then cut with a jigsaw. 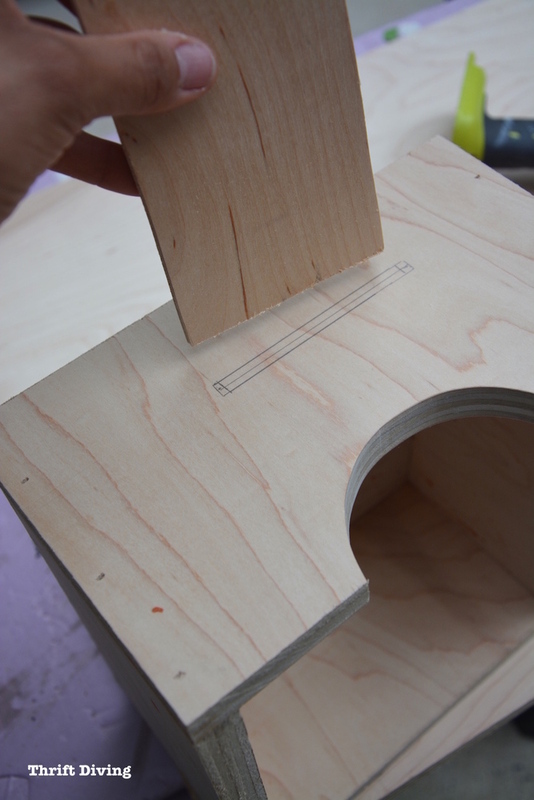 Cut a long piece of 1/4" birch plywood, about 7 inches (or whatever length you want) which will be the lever that will slide in and out to release the candy. 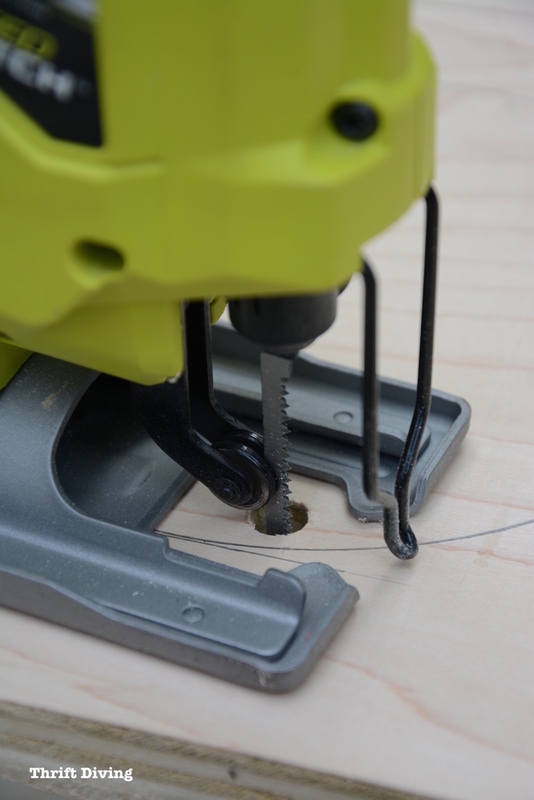 Then, about 2" from the top of the front, trace the edge and cut with a jigsaw (TIP: use the power drill for a pilot hole first). 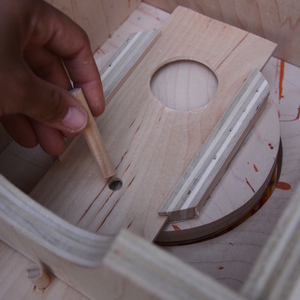 The lever will have a hole (using the hole saw) that, when pulled, will align the holes and allow candy to come out of the upcycled fish bowl. 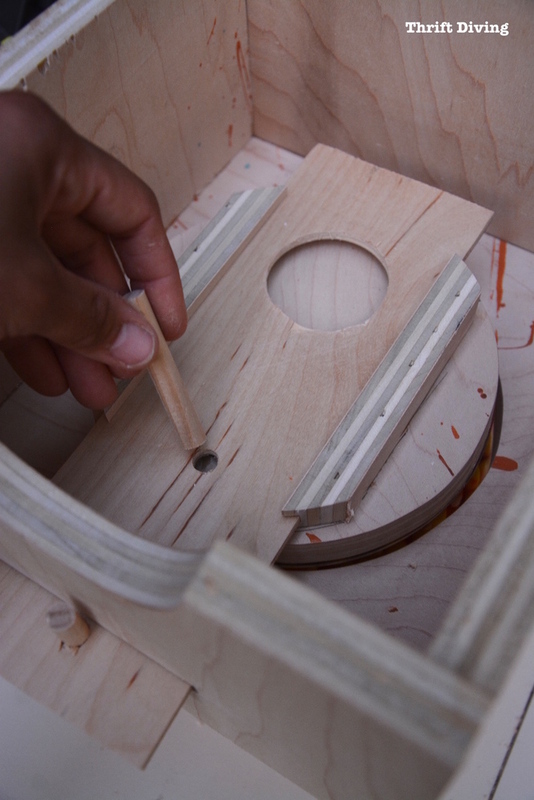 In order to create stopping points (so the lever doesn't come all the way out or be pushed all the way in by accident), however, you have to drill holes with a bit and insert a wooden dowel into the holes. 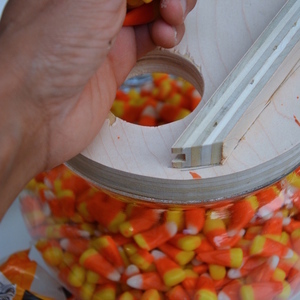 Once you've created the holes and lever, add candy and test it out to be sure it works! Make any adjustments necessary. 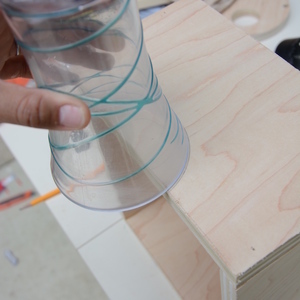 The inside of the candy dispenser will be constructed with wood that, when the candy is released, will slide down towards the opening. 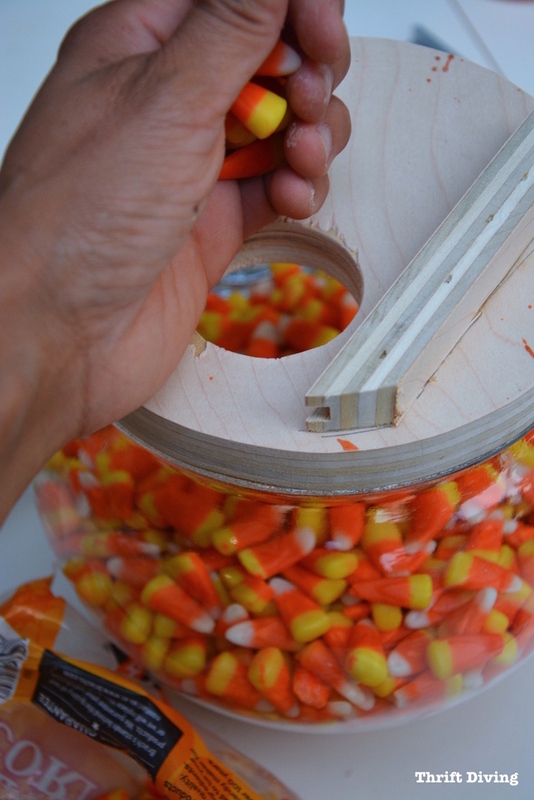 Add wooden sides so that the candy can't go anywhere but out the opening. 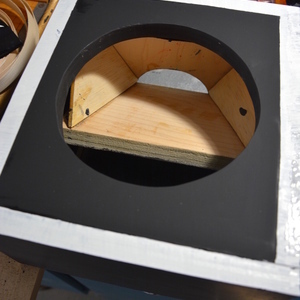 Super glue and wood glue worked well holding it together. 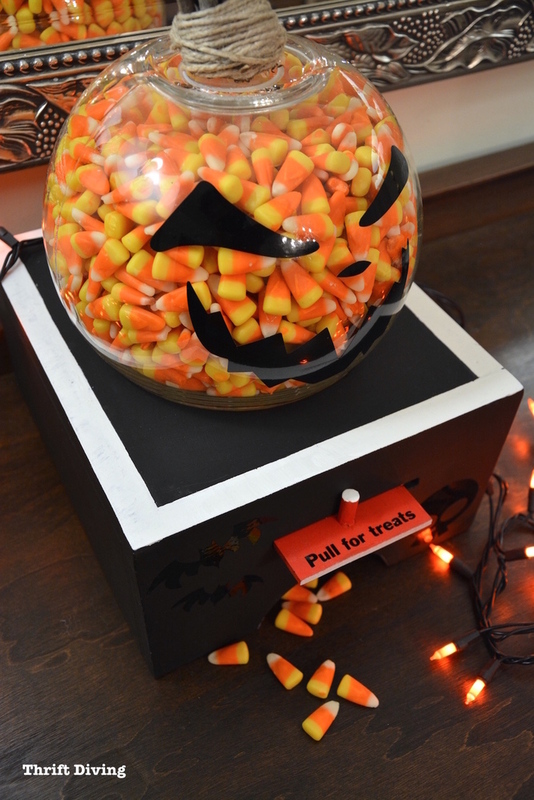 Choose whatever paint and decorations for your candy dispenser! 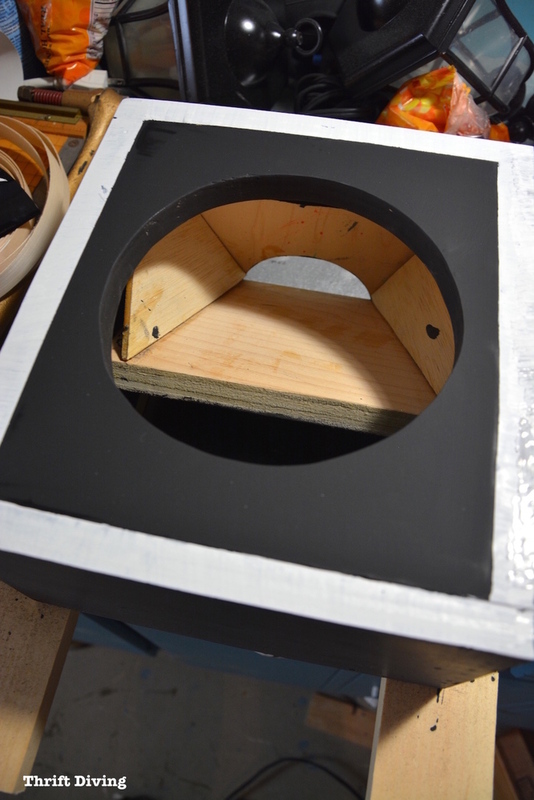 I chose a chalky black paint with white detailing, with red. Ths is also what the inside looks like when looking at it from above. 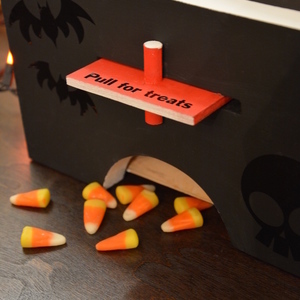 Notice how the wood slants towards the opening so that the candy only have one place to go when released. I added some vinyl that was cut with my Silhouette Cameo cutting machine. 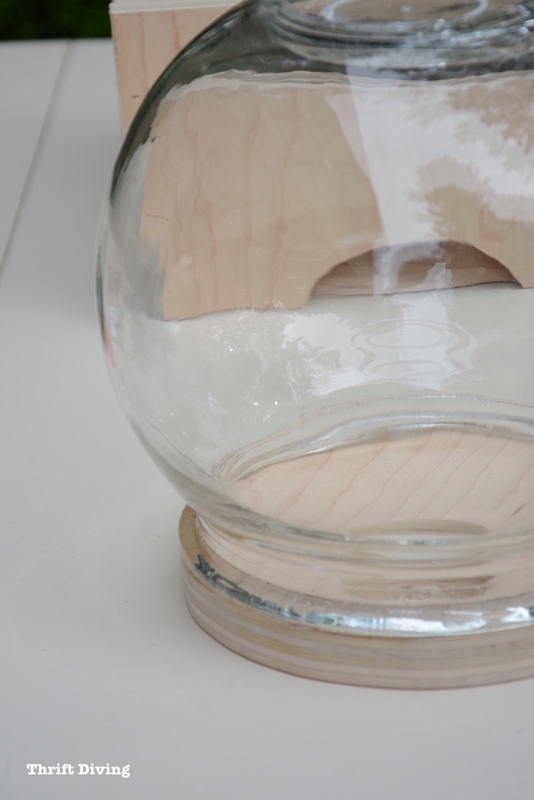 I added a spooky face to the fish bowl with vinyl, as well. 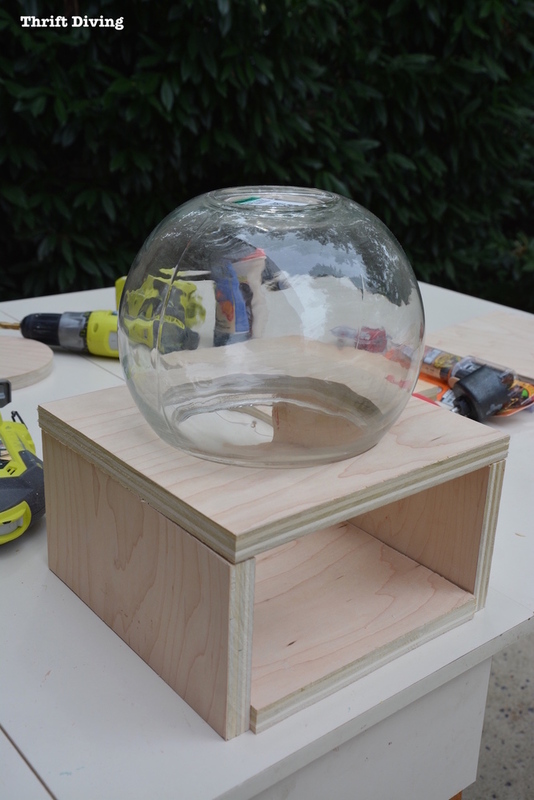 Now you've got an amazing DIY candy dispenser! 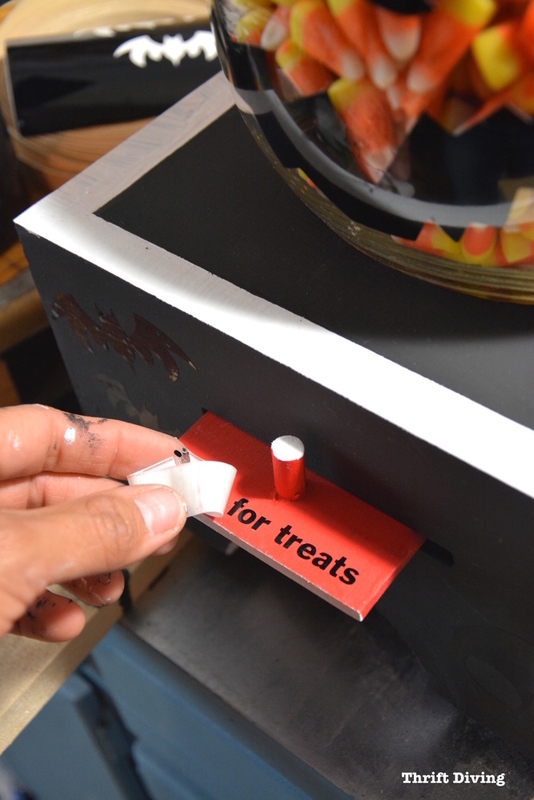 The vinyl can be easily peeled off, so after Halloween, you can remove the vinyl and add other candy. Just have fun with it! 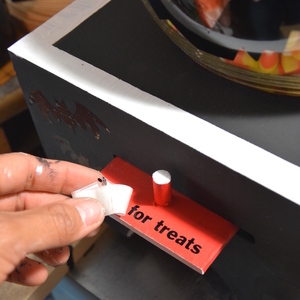 Test it out and make sure it works, and then let your family enjoy pulling the lever for treats this Halloween season! Aww, thanks, fEzZ! Glad you like it!! Love this! I would love to see projects DIY Christmas wreaths! 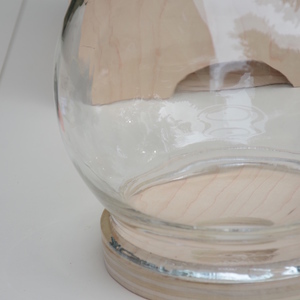 Love the project - I know what I will be looking for on my next trip to the thrift store! I would love to see some outdoor holiday decorating ideas. My Mom really decorates up her front lawn & the front of the house every year, but the store bought decorations are getting old and are starting not to work anymore. At 93 tears old, she can’t do the yard decorating herself anymore, so my brother & I visit her in early December to put up her decorations. I would love to see outdoor decorations that we could add lights to, that we could make & put in her yard. Great idea! I haven't done a bunch of holiday decorating, but I'm addicted now! I can't wait to do some things for Christmas! :) I'll come up with some fun ideas for you! I love your dispenser. I would love to see some Christmas outdoor ideas. This is a great tutorial. It could be decorated for any holiday. I love wooden Christmas trees and would really like to see some wooden. Christmas decor. Very cute, very ambitious for a gal who doesn't "do holiday decorating". Good job! LOL, Thanks, Mary!! :) I'm glad I was challenged to do some holiday stuff! I would love to see an advent calendar or a creative way to display Christmas Cards. That would be a great project! Thanks for the idea! Great idea. For Christmas I would like to see ideas that are easier to store and possibly a bit lighter in weight. 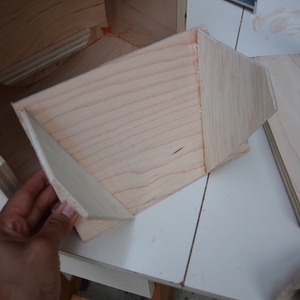 I often love so many ideas but the storage and ability to move them make it prohibitive to consider the project. I guess taking your idea to the next level, it would be really fun to do something for Christmas that was interactive. Maybe something like a santa that comes down the chimney?? So very creative! I have never used power tools. Can you think of a beginners power tool project for a front porch? My hubby has lots of ply-wood around. :) Thanks again! Thank you! This is neat idea. I would love to see how to transfer to wood - art or words. Easiest way possible. For example, making signs for outdoors etc. Or what to do with leftover pavers?? I have a bunch left from our patio and I'd like to use them to make decor etc for our outdoors. However, I have no clue what to do with those pavers? Great tutorial! I would love to see some outdoor decorations for Christmas that you can add lights to! Also would love to see some Christmas stocking holders. Thanks. So cute for Halloween. I'd love to see more Christmas ornaments & pallet projects. I love making new things out of repurposed objects. I have pinned this idea and would enjoy seeing the two ideas Michele mentions above. Hate to be a copy cat but they are good ideas! would especially love to make an advent calendar. Love this. Would love to see lawn ornaments made from pallets. 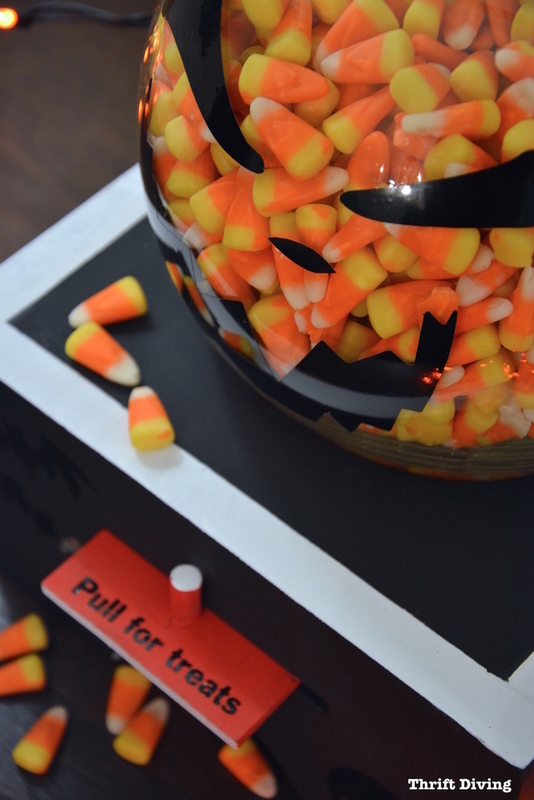 The Halloween Candy dispenser is really awesome. I'd like more small craft projects like this, wreaths, frames, and seasonal decorations. This is so cute! I think a moving Santa in a sleigh made from wood would be so fantastic! I think a wood cut out Christmas tree would be cool!! This is so creative! 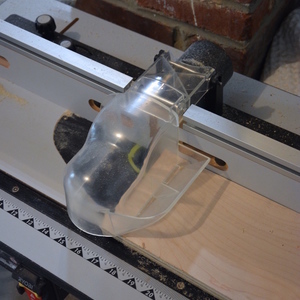 I'd love to see a project with the scroll saw. I "think" I want one. 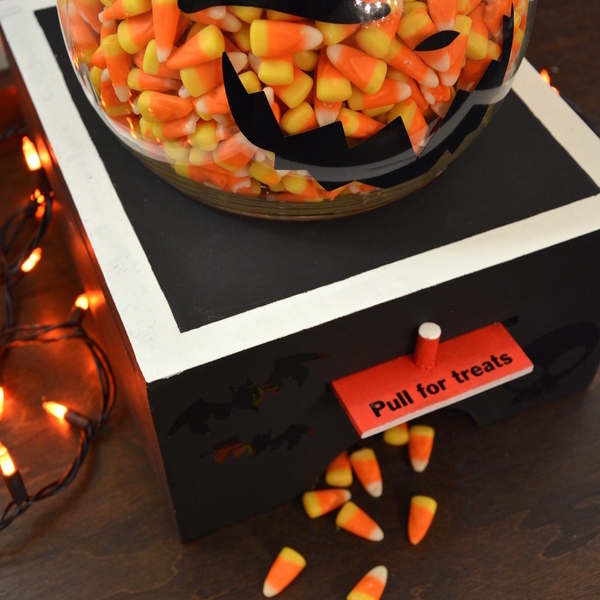 Super cute idea especially for the office during Halloween. I love Christmas & Halloween. Maybe more outdoors decoration crafts. thank you for all your hard work & great ideas!! I would love to see some plans for snowmen made out of pallets. They are great for the Holiday season but can still be cute decor into Jan and February. Let's make a custom Christmas tree toppers!!! Not sure if the holiday project idea is to be here or at Your Thrift Diving blog so will post at both. 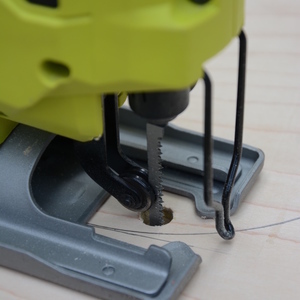 Would love to see you use your miter saw to make a Christmas Tree wallhanging for your front porch! So cute!!! I would love to see some cute fall decorations for Thanksgiving that will last from year to year. Thanks for a great post AND a great giveaway! Your creativity is really inspiring! I would love a sleigh made from repurposed items. Great tutorial. I am pinning this post. 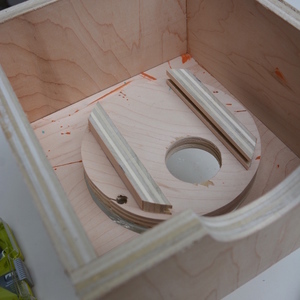 I would love to see some gift giving wood working projects like cutting boards for the chefs in my life or sturdy lined boxes to store the holiday silver settings. I love wood working and just promoted out of job that gave me access to all the shop tools like table saws, planers, radial arm saws. I am so going to miss the smell of fresh cut wood until I can build up a private collection of tools. What a great use for our old fish bowl, love it. I would love to see 3-d Christmas ornaments made, like the big balls for your yard. Looking forward to seeing what craft ideas you come up with! Awesome! I would love to see some large yard art Christmas projects!! Thus is so cute. Going to show this to my daughter she might be able to use this in her classroom. Great tutorial! I would have to make mine a gum-ball machine though. You make it look so easy too. Nice job. 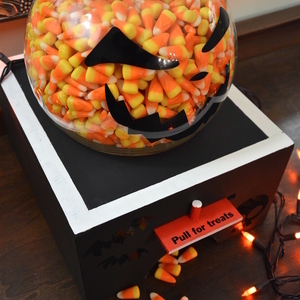 I just hope if it was an upcycled fish bowl it was cleaned thoroughly with Clorox sufficiently before using to dispense candy! I absolutely love this! I would like to see some giant candy canes to frame the doorway! That;s a great dispenser! How about a project for Christmas that is a large outdoor tree made with wood and lights? I have so much scrap wood, maybe an advent/countdown type of project for the holidays? Very cute idea! As someone else mentioned, a nice display for Christmas cards that I personally would use in my office to add a little decoration in a small space. Just started tackling a house that was from the 1920's covered up by 70's paneling, carpet etc...lots of work to bring back it's character, but will eventually have a beautiful house to decorate!